Thirteen star flags have been produced throughout our history, and are symbolic of our original 13 colonies and 13 states at the time of our nation's founding. Because of this symbolism, Americans are always drawn to early antique 13 star flags. One might think that there are many surviving original 13 star flags which dating to the time of the Revolution, but that is not the case. In fact, scholars of the American Flag are not certain if, in fact, any actual period 13 star flags, from the time of the Revolution, have survived. Some collectors believe that there are flags that date from this era, and within the Rare Flags collection, it is possible that at least one flag, a very rare flag in the Trumbull pattern, IAS-00225, dates to this early period. Even into the 20th century, 13 star flags were produced for common use, most notably as a maritime ensign aboard private, commercial and military vessels. The patterns used for this purpose are varied. Prior to the Civil War, 13 star flags used for naval ensigns varied in pattern, but the most common was the 4-5-4 pattern, which was known to date as early as the Revolutionary period. During the Civil War, a transition to the Hopkinson pattern of 3-2-3-2-3 stars emerged in the official regulations, and this pattern prevailed through the 1870's and 1880's. Another pattern, the 13 star medallion pattern, emerged during the period of the American Centennial in 1876. This pattern is seen on the flag showcased here. There are a few examples of the pattern that pre-date the Civil War, but by the 1890's and into the early 20th century, the medallion pattern 13 star flag became popular with Americans who apparently wanted some variation from row patterns that prevailed on the 45, 46, and 48 star flags. Early thirteen star flags, even from the early 20th century, are scarce. 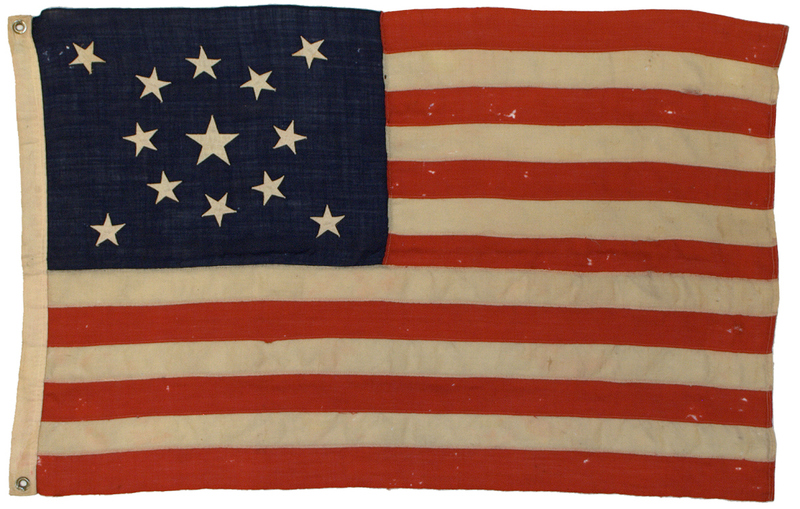 Flags from the late 19th and early 20th centuries, such as this flag, are usually machine stitched with stars affixed using a zig-zag stitches. This particular flag is especially fine among later period 13 star flag. It is well proportioned and nearly completely intact, with only minor mothing. It features a large center star, which is visually appealing and interesting. Also, the stars of the flag are allowed to rotate on their axis--notice how the top corner stars point in different directions form the bottom two corner stars. The colors of the flag remain vibrant. Overall, this rare flag well represents those later period antique 13 star American flags produced for modern purposes, but evoke the memory of the earliest flags of the American Republic.